Are you looking to get a brighter, whiter smile? 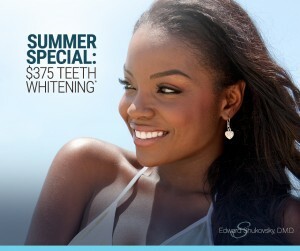 This summer, we are offering a special price for quick, comfortable, and effective teeth whitening! Our summer whitening special includes two-parts: a professional in-office treatment and a set of professional grade take-home trays. The in-office portion of the treatment can be completed in as little as five minutes, so it can easily be added on to a normal hygiene appointment. With this exclusive new treatment, your teeth can be 4-5 shades whiter before you even leave our office! Most importantly, unlike with many other teeth whitening products, patients experience little to no sensitivity! Normally valued at $450, we are now offering this unique teeth whitening procedure for only $375! When you come into our office, we use a special teeth whitening product called Phillips Zoom QuickPro. This treatment only takes about five minutes, so many patients choose to include it as part of their regular dental check-up. First, we coat the teeth with the whitening product. Next, a sealant is applied, to keep the product from rubbing off. Then you’re ready to go! Approximately 30 minutes after your treatment, simply brush your teeth to remove the thin film. Before you leave our office, we will provide you with Opalescence Go – a professional take-home product that can enhance your results even more! The kit contains 20 take-home whitening trays (10 trays for the top teeth and 10 trays for the bottom teeth). These trays are pre-filled, disposable, and designed to adapt and fit snugly to your teeth. Since we will not need to create customized trays for you, no impressions are needed! If you have an upcoming event, or just want to improve the appearance of your smile, this is a great way to whiten your teeth quickly and conveniently at a great price! If you are interested in learning more, or would like to schedule an appointment, please contact us today.